Over the weekend, my husband and I decided to get out of the city so we headed back up to Tennessee where both of our parents live. After a delicious lunch on Saturday, my husband and I decided to make a decadent dessert. 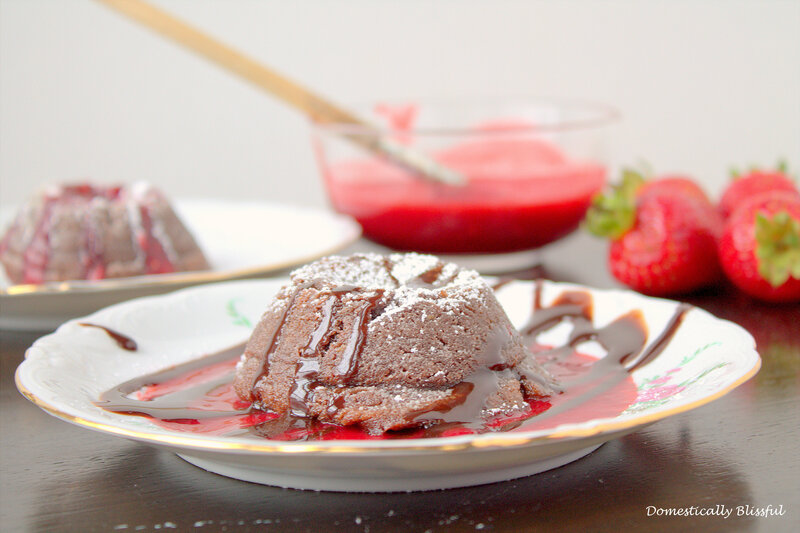 After going through lots of recipes – and getting ideas for future desserts – we decided to make Chocolate Lava Cakes with a Berry Drizzle Sauce. 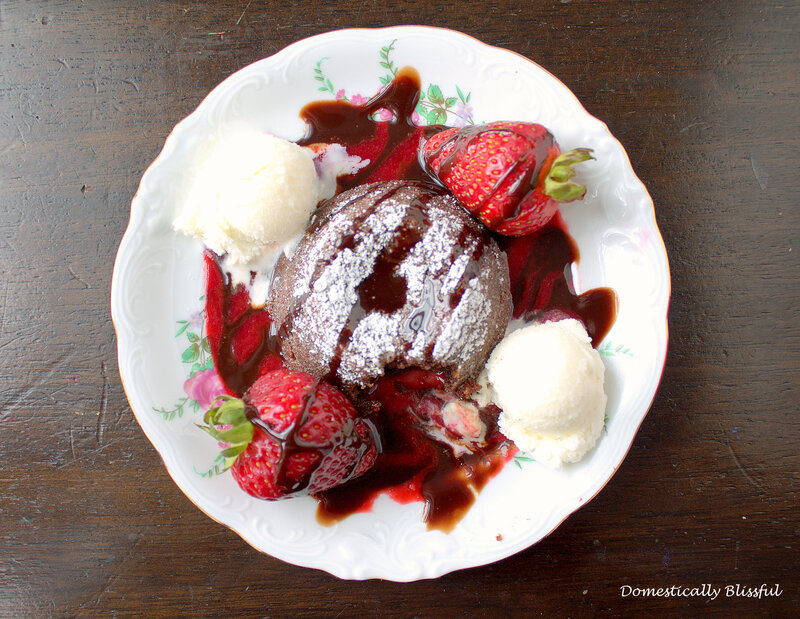 The Chocolate Lava Cake recipe that we landed on is from the cookbook Mmmm… Chocolate and my ingenious husband came up with this delicious Berry Drizzle Sauce. First, preheat oven to 400°. Spray a muffin tin – for 12 lava cakes – with flour spray and sprinkle a little bit of sugar into each of the 12 muffin tins. Using a double broiler – or a glass bowl over a pot of simmering water – over medium heat, melt the butter and the chocolate chips. 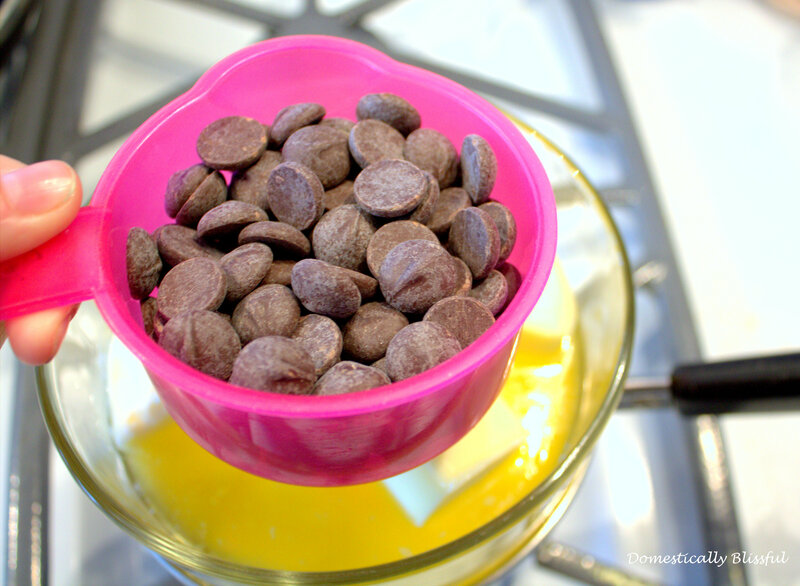 Once melted, set to the side and let cool – you don’t want the buttery chocolate mix to cook the eggs. In a bowl, whisk together the 4 eggs, 2 teaspoons vanilla extract, and 4 tablespoons of all purpose flour. 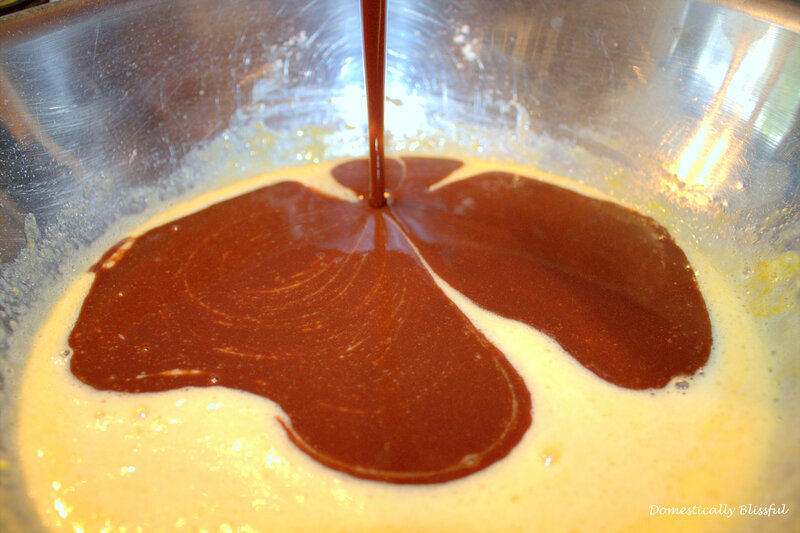 Then add the cooled to room temperature buttery chocolate and blend together. Evenly pour the mixture into the prepared muffin tins and cook for 10-15 minutes. If you bake it on the lower side – 10-12 minutes – the center will be more molten inside. 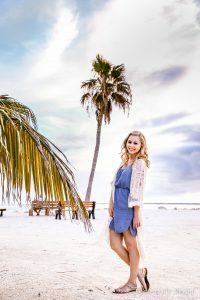 The longer you bake the lava cakes the more cake like the center will be – which is how my husband and I prefer it, we have a slight fear of undercooked eggs. This is the perfect time to make the Berry Drizzle Sauce. First, wash the fruit and place them in a bowl along with 1 teaspoon of sugar. – We didn’t have any blackberries so we used my mother’s homemade blackberry jam. 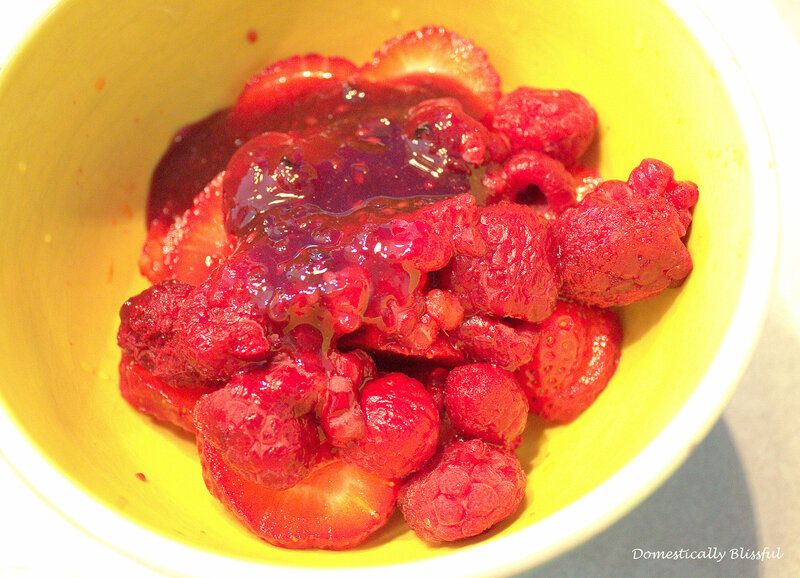 Blend the berries with a hand blender until well blended and set to the side. 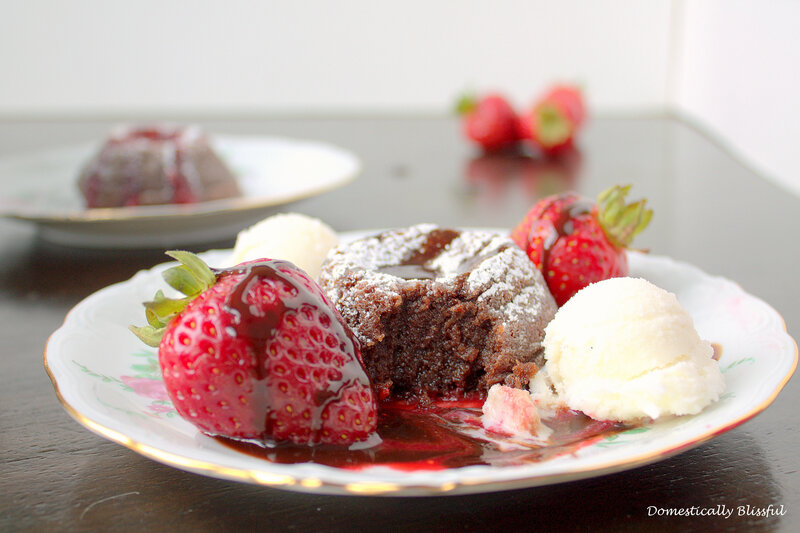 Once raised, remove the Chocolate Lava Cakes from the oven and let cook for about a minute. The easiest way to remove the lava cakes is to place a flat cookie sheet on top of the muffin pan and flip it over. The lava cakes should slip right out. 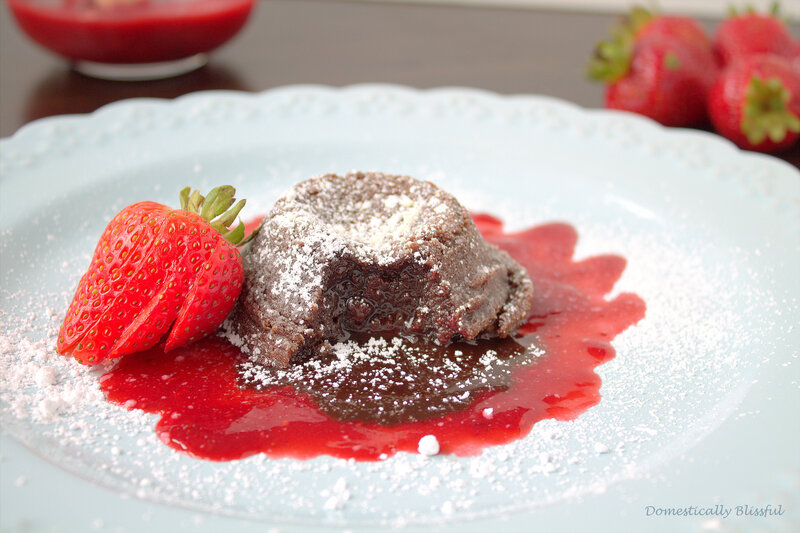 Enjoy these Chocolate Lava Cakes on a bed of Berry Drizzle Sauce with a sprinkle of powered sugar on top! Using a double broiler over medium heat, melt the butter and the chocolate chips. Once melted, set to the side and let cool. 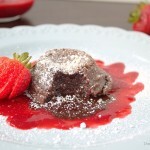 While the chocolate lava cakes are baking prepare the berry drizzle sauce. First, wash the fruit and place them in a bowl along with 1 teaspoon of sugar. Blend the berries with a hand held food processor until well blended and set to the side. If you bake it on the lower side – 10-12 minutes – the center will be more molten inside. The longer you bake the lava cakes the more cake like the center will be .